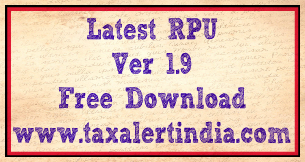 Tin.nsdl launched latest return preparation utility RPU version 1.9 for regular and corrective statements from Financial year 2007-08 and onwards. This new RPU 1.9 is in java platform which can be used either offline or online modes. There are many new features in RPU version 1.9 which are as follows. “PAN of Landlord” field has been revised for form 24Q-Q4 under Annexure II (i.e. Salary details) from F.Y. 2016-17 onwards. Existing Validation of structurally valid PAN for field no. 34, 36, 38 and 40 has been relaxed. These fields may contain any value from the below mentioned when the landlord does not have PAN. 1. Payment made to Government organization (Central/State only): This is applicable when landlords are Government organizations (i.e. Central or State). 2. Payment made to Non-resident: This is applicable when the landlords are Non-Residents. 3. Payment made to Other than Government organization and Non-resident: This is applicable when the landlords are other than Government organization and Non-Residents. Non-update of Deductee/Collectee records from Annexure I and Annexure ll in TDS/TCS correction statements when Form 26A/27BA has been generated. - Deductee against which Form 26A/27BA has been generated at Income Tax Department where no update or deletion of record will be allowed in Annexure ll of Form 24Q while submitting correction statement. - Such Deuctee/Collectee records will be present in the TDS/TCS consolidated file with a flag value ‘F’ against the field ‘Mode’ as per specified file format. - This is applicable from Financial Year 2007-08 onwards. - e-TDS/TCS correction statements received with the changes not desired as per above, will be rejected at TDS CPC of Income Tax Department. - Incorporation of latest File Validation Utility (FVU) version 5.4 (applicable for TDS/TCS statements pertaining to FY 2010-11 onwards) and FVU version 2.150 (applicable for TDS/TCS statements from FY 2007-08 up to FY 2009-10).